Copyright: © 2018 Hong F, et al. This is an open-access article distributed under the terms of the Creative Commons Attribution License, which permits unrestricted use, distribution, and reproduction in any medium, provided the original author and source are credited. Although nano-TiO2 has been extensively used in food industrial application, and in daily products for infants and children, its potential neurotoxicity presents a significant concern. As previous studies have demonstrated the neurological effects of nano-TiO2 in mice, the main objective of the current investigation was to establish the effects of prenatal exposure of nano-TiO2 on developing embryos and offspring. ICR female mice were orally administered (1, 2, and 3 mg/kg body weight) nano-TiO2 from prenatal day 2 to postnatal day 21. 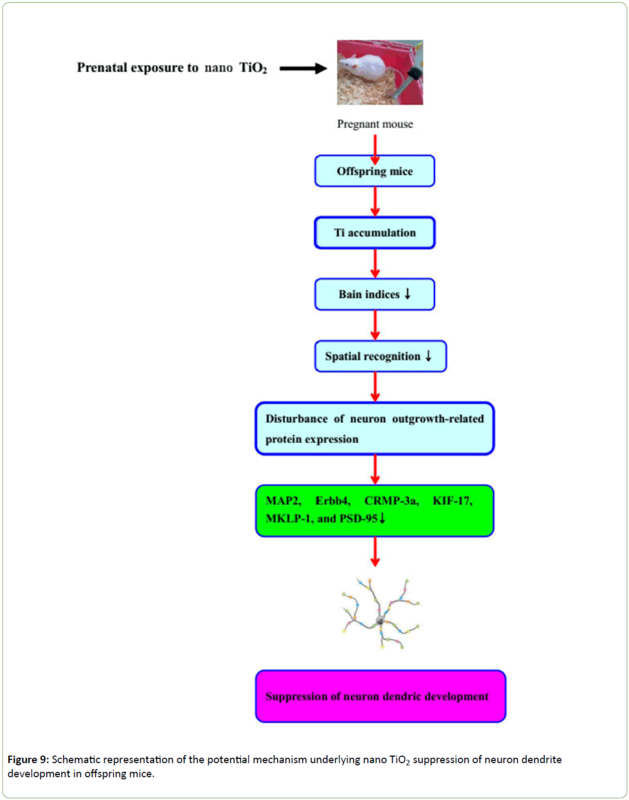 Morphological changes, learning and memory, and potential target molecules of neurodevelopmental toxicity in offspring mice of nano-TiO2-exposed mothers were examined. The results showed that nano-TiO2 could translocate from prenatally exposed maternal to offspring hippocampi, resulting in hippocampal damage including: a 29.07%-61.4% reduction in spatial recognition; a 22.55% -61.34% reduction in total dendritic length; a 53.57%-71.42% reduction in dendritic branch number; and a 27.72%-75.74% reduction in spine density in offspring CA1 pyramidal cells. Furthermore, expression of several proteins involved in dendritic development was decreased including: a 47.62%-73.81% in microtubule-associated proteins; a 14.58%-54.17% in mitotic kinesin-like protein 1; a 1.14%-31.82% in collapsin response mediator protein 3; a 65.17%-79.05% in neuregulin tyrosine kinase receptor 4; a 1.13%-76.92% in kinesin superfamily protein 17; and a 25.73%-61.4% in post synaptic density protein -95 in offspring hippocampi. Hippocampal neurons may present a major target of neurotoxicity in offspring following maternal exposure to nano-TiO2 during the prenatal period. Therefore, food application of nano-TiO2 should be performed with caution. Owing to its high brightness and refractive index, nano-TiO2 is commonly used as a pigment in different fields and accounts for almost 70% of the total production volume of all pigments worldwide . Nano-TiO2 is among the top five nanoparticles used in consumer products, including paints, cosmetics, sunscreens, food products, toothpaste, sterilization, air cleaning and waste water treatment, and articulating prosthetic, hip and knee implants [2-7]. However, nano-TiO2 has been shown to enter the body and to be deposited in various organs via exposure routes (such as inhalation, injection, dermal and gastrointestinal tract absorption), leading to organ toxicity in mice and rats . For example, Liu et al. reported that following injection of nano-TiO2 into the abdominal cavity of ICR mice for 14 consecutive days, nano-TiO2 deposition occurred in various organs in the following order; liver>kidneys>spleen>lung>brain>heart . Although nano-TiO2 is considered to be physiologically inert to humans, numerous studies to date have reviewed the toxic effects of nano-TiO2 on the central nervous system (CNS) of mice and rats [8,10-15]. Previous studies suggest that nano-TiO2 deposited in the mouse hippocampus causes vacuole oxidative damage and cellular degradation in hippocampal neurons, decreased numbers of Nissl bodies in the CA1 region, and increased glial fibrillary acidic protein expression, acetylcholinesterase activity, and glutamate and NO production in the CA4 region, which result in inflammation [16-18]. Furthermore, exposure to nano- TiO2 promotes calcium deposition in neurocytes and proliferation of ependymal and glial cells, and disrupts the homeostasis of trace elements, neurotransmitters and enzymes, which lead to oxidative damage, hippocampal apoptosis, and a reduction in spatial recognition memory in mice [19-25]. Importantly, development of humans and animals and in particular, in the developing brain, is significantly influenced by environmental factors [26,27]. Prenatal exposure to nano-TiO2 is reported to affect the expression of genes related to the development and function of the CNS and to induce elevated caspase 3 levels in the olfactory bulb of mouse brain and in dopamine and its metabolites in offspring mice [28-30]. These detrimental effects have further been shown to decrease hippocampal neuron proliferation and synaptogenesis in addition to learning and memory and long-term synaptic plasticity during development in offspring rats [31-33], and to increase depressive-like behavior during adulthood in forced swimming and sucrose preference tests in offspring rats . However, it remains to be established whether the decrease in offspring spatial recognition memory induced by nano-TiO2 is associated with disruption of neuronal dendrite development. Here, we examined the hypothesis that nano-TiO2-mediated reduction of neuronal synaptic plasticity and cognitive function during development in offspring may be related to disruption of dendritic development and influence normal and consequent construction of neural networks. The mechanism underlying the negative effects of nano-TiO2 on hippocampal dendritic growth may involve interactions with key proteins related to dendritic development. Accumulating evidence has shown that tubulin, microtubule-associated proteins (MAPs, including MAP2), and apophysis developmentassociated proteins, such as mitotic kinesin-like protein 1 (MKLP1), collapsin response mediator protein 3 (CRMP3), neuregulin tyrosine kinase receptor 4 (ErbB4), and kinesin superfamily protein 17 (KIF17), play important roles in dendritic development [35-40]. We were interested in establishing whether these proteins contribute to the neurodevelopmental toxicity effects of nano-TiO2. ICR female mice were selected as the experimental model and exposed to nano-TiO2 through oral (gavage) administration from prenatal day 2 to postnatal day (PND) 21. Morphological changes as well as effects on learning and memory were examined in offspring mice following maternal nano-TiO2 exposure and potential nano-TiO2 target proteins were identified, with a view of clarifying the specific mechanisms associated with its toxic effects on the developing CNS. Nanoparticulate TiO2 was prepared by controlled hydrolysis of titanium tetrabutoxide. Details of the synthesis and characterization of nano-TiO2 are described in a previous report by our group . Nanoparticle characteristics were as follows: anatase phase, particle size, 6.5 nm; hydrodynamic diameter, approximately 294 nm; surface area, 174.8 m2/g; and zeta potential, 7.57 mV . All animal experiments were conducted during the light phase and approved by the Animal Experimental Committee of Soochow University (China) (Ethical approval number 2111270). Procedures were performed in accordance with the National Institutes of Health Guidelines for the Care and Use of Laboratory Animals. Twenty-four specific pathogen-free (SPF) pregnant mice were purchased from the Animal Center of Soochow University (China) and maintained at the same center in individual cages with free access to water and sterilized food. Pregnant mice were randomly divided into four subgroups (n=6 per group), including a control group treated with 0.5% w/v hydroxypropylmethylcellulose (HPMC; Sigma-Aldrich, St. Louis, MO, USA) and three experimental groups treated with 1, 2, and 3 mg/kg BW nano-TiO2, respectively, under SPF conditions. For appropriate dose selection, we consulted previous reports [1,24,41]. Animals received 1, 2, and 3 mg/kg body weight (BW) of nano-TiO2 orally (gavage), respectively, from prenatal day 7 to post-natal day (PND) 21. The same schedule was applied to control pregnant mice treated with 0.5% w/v HPMC. Offspring mice (n=30 per group) delivered spontaneously were reared with their respective dams until the time of initial experimentation at prenatal day 7. Pups were separated from the mother at PND 21 and housed in cages in an isolated animal room under SPF conditions for 21 days. The room environment was set up at 24 ± 2°C under 60% ± 10% relative humidity and a 12 h light/dark cycle. After PND 21, acquisition of spatial recognition memory was measured in offspring using the Y-maze (n=10 per group). To avoid stress-related interference in the learning procedure, offspring mice were not handled by the experimenter but allowed to voluntarily enter the maze. The Y-maze test for acquisition of spatial recognition memory in offspring mice has been described previously [42,43]. To determine spatial recognition memory, the number of entries and time spent in each arm of the maze by individual offspring mice were recorded, and novelty versus familiarity were analyzed by comparing behaviors in all three arms. The number of arms visited was taken as an indicator of locomotor and exploratory activity . Offspring mice that experienced behavioral experiments were not used for Golgi-Cox staining. Hippocampal tissues of offspring mice (n=5 per group) were thawed, and ~15 mg of samples were digested and their titanium contents determined using an inductively coupled plasma-mass spectrometry (ICP-MS; Thermo Elemental X7; Thermo Electron Co., Waltham, MA, USA) [20-22]. For pathologic studies, histopathologic examination was performed using standard laboratory procedures. Briefly, hippocampi (n=5 in each group) were embedded in paraffin blocks, then sliced (5 μm thickness) and placed onto glass slides. After hematoxylin-eosin staining, the stained sections were evaluated by a histopathologist, unaware of the treatment, using an optical microscope (Nikon U-III Multi-point Sensor System, Japan). Briefly, Golgi-Cox impregnation and staining and statistical analysis of offspring hippocampi were performed as previously described . Offspring hippocampal sections (100 μm) were cut on a cryostat, mounted onto gelatin slides, cleared with ethanol and xylene, and cover slipped. Morphology was evaluated on coded slides by an observer blinded to the treatment groups using an Olympus BX-51 microscope equipped with a computer-controlled motorized stage and Neurolucida software (MBF Biosciences, Williston, VT, USA). Total protein was extracted from offspring hippocampal tissues using RIPA buffer (Cell Signaling Technology, Inc., MA, USA) and protein concentrations were determined with a standard bicinchoninic acid protein assay kit (Thermo Fisher Scientific Inc., IL, USA). Protein samples were separated via 8%, 10% or 12% sodium dodecyl sulphate-polyacrylamide gel electrophoresis and electroblotted onto nitrocellulose membranes. Membranes were initially blocked with phosphatebuffered saline (PBS) containing 5% fat-free dry milk for 2 h and incubated overnight at 4°C with the appropriate primary antibodies. After washing with PBST (a mixture of PBS and 0.05% Tween-20) three times (10 min each), membranes were incubated with secondary HRP-conjugated antibodies for 2 h at room temperature and re-washed three times with PBST (10 min each). Signals were detected using an enhanced chemiluminescence kit (Thermo Fisher Scientific Inc., IL, USA). 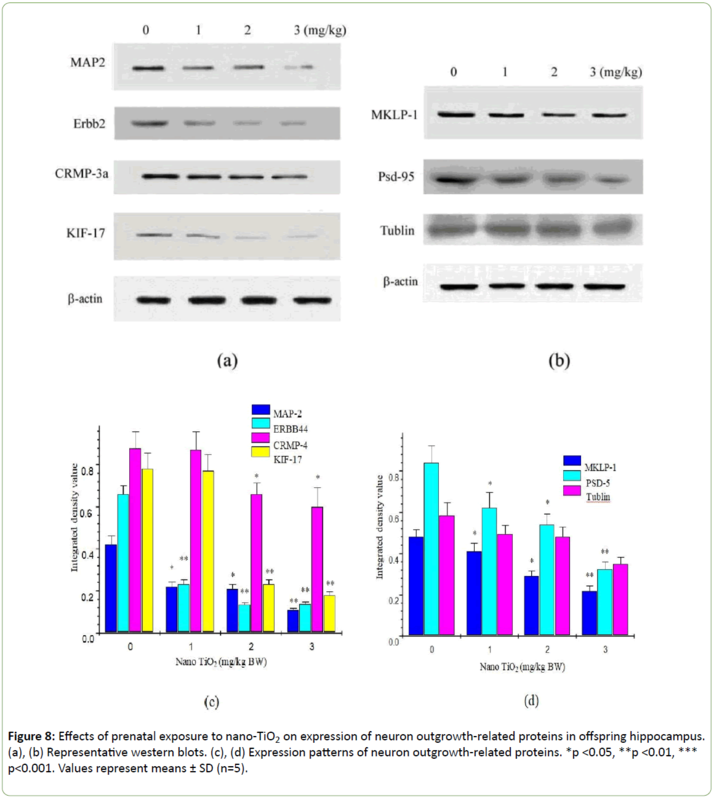 Western blot was employed to detect expression of post synaptic density protein (PSD)-95, ErBb4, tubulin, KIF-17, MAP2, MKLP1 and CRMP-3a. Anti-CRMP-3 (C-20)(1:500) and anti-KIF17 (M-20)(1:500) antibodies were obtained from Santa Cruz Biotechnology Inc. (USA), anti-ErBb4 (1:4000), anti-MAP2 (1:2000), anti-Tubulin (1:500) and anti-PSD-95 (1:500) antibodies from EMD Millipore, and anti-MKLP1 (1:2000) antibody from Abcam (Cambridge, UK). Expression of β-actin was detected using an anti-β-actin antibody (diluted 1:2000; Abcam) as the loading control. Data were analyzed using Statistical Analysis Software (SAS 9.1) (Chicago, IL, USA). The significance of differential expression between groups was assessed using one-way ANOVA followed by Tukey’s HSD post-hoc test, and results are presented as means ± standard deviation (SD). Differences were considered statistically significant at p<0.05. 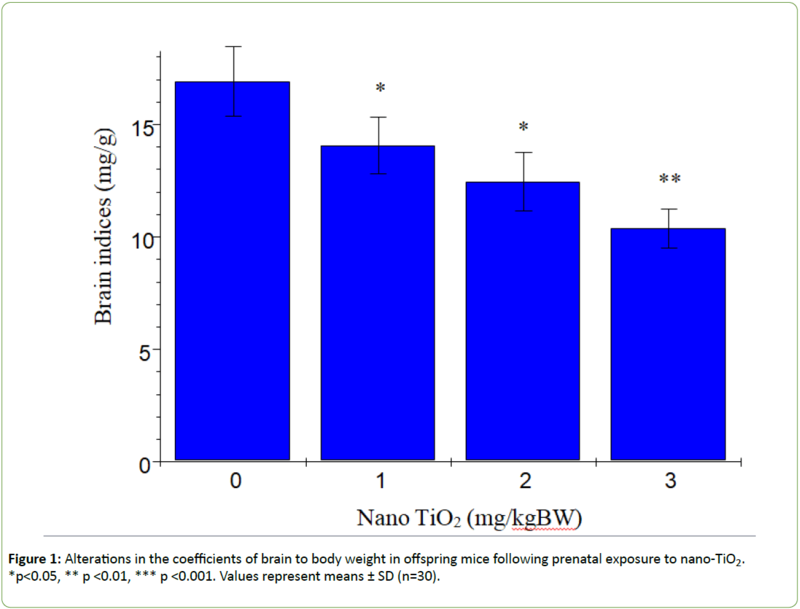 Figure 1 presents the changes in offspring brain coefficients caused by prenatal exposure to nano-TiO2. We observed a significant reduction in the brain coefficients in offspring subjected to prenatal nano-TiO2 exposure (p>0.05). Titanium contents in offspring hippocampi are shown in Figure 2. With increasing nano-TiO2 doses, titanium accumulation in offspring hippocampi was markedly increased (p<0.001). Figure 1: Alterations in the coefficients of brain to body weight in offspring mice following prenatal exposure to nano-TiO2. *p<0.05, ** p <0.01, *** p <0.001. Values represent means ± SD (n=30). 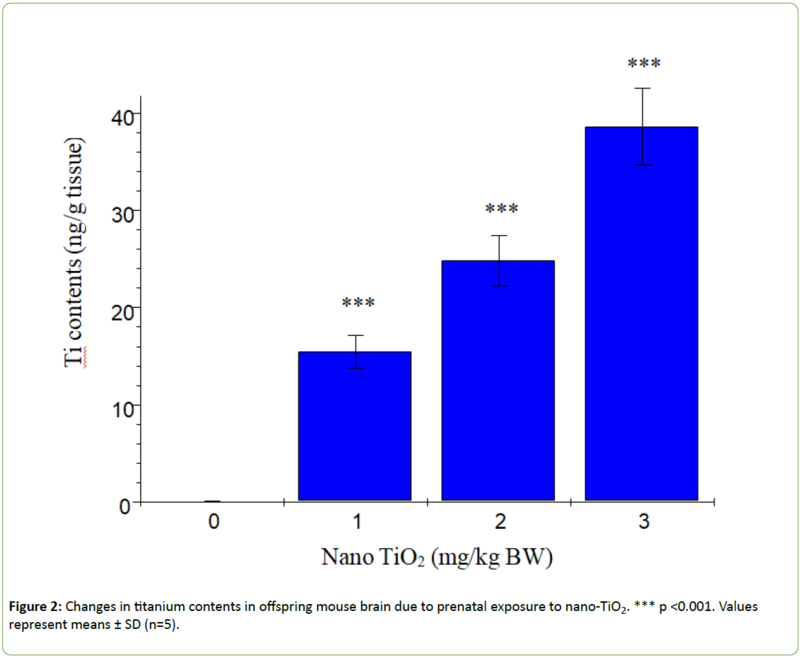 Figure 2: Changes in titanium contents in offspring mouse brain due to prenatal exposure to nano-TiO2. *** p <0.001. Values represent means ± SD (n=5). According to Dellu et al. , the two-trial Y-maze task is a specific and sensitive test of spatial recognition memory in rodents, while the primary purpose of the novel arm is to test discriminatory memory. In the latter test, mice have to make a choice between a novel (unfamiliar) and a familiar arm when they are released from the start arm in the Y-maze .The changes in learning and memory of offspring mice induced by nano-TiO2 are depicted in Figure 3. The results showed that offspring mice exposed to nano-TiO2 had a higher percentage duration in the novel arm relative to that in the start and other arms than those in the control group. Notably, duration in the novel arm of offspring from 1, 2 or 3 mg/kg nano-TiO2-treated pregnant mice was lower compared to that of offspring from control pregnant mice (p<0.05), indicating that prenatal exposure to nano-TiO2 decreased spatial recognition memory in offspring. locomotor activity is a function of the level of excitability of the CNS . Changes in offspring locomotor activity (maze arm visits) affected by nano-TiO2 are presented in Figure 4. The collective findings indicate that prenatal exposure to nano-TiO2 decreased the number of arm entries in offspring mice (p<0.05). 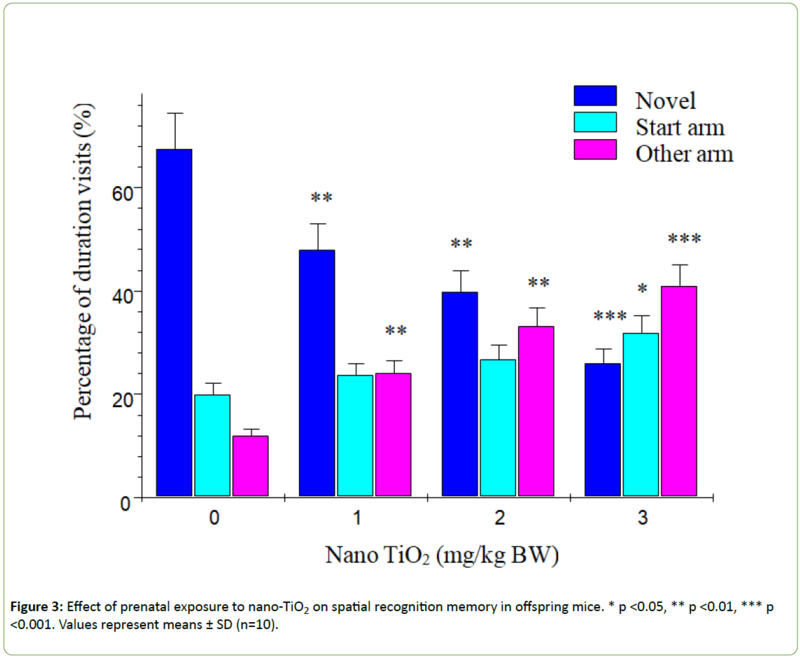 Figure 3: Effect of prenatal exposure to nano-TiO2 on spatial recognition memory in offspring mice. * p <0.05, ** p <0.01, *** p <0.001. Values represent means ± SD (n=10). 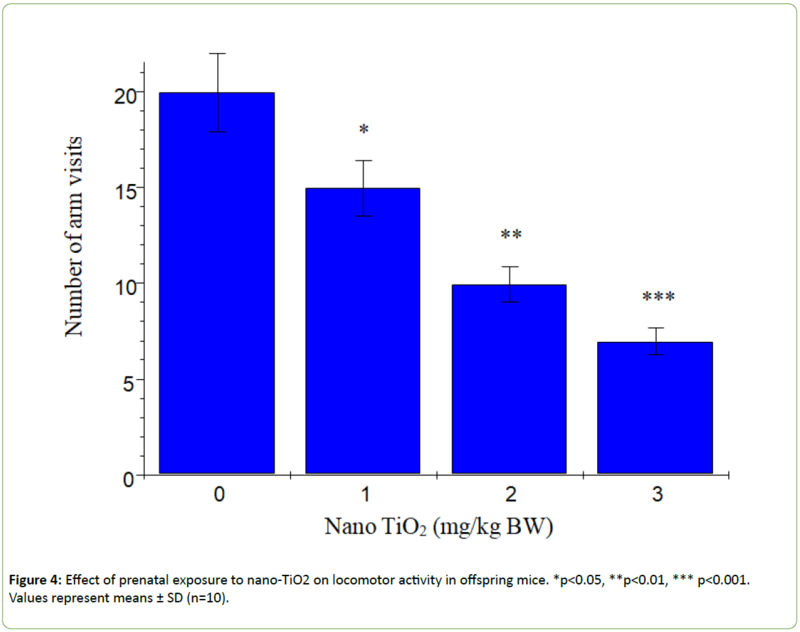 Figure 4: Effect of prenatal exposure to nano-TiO2 on locomotor activity in offspring mice. *p<0.05, **p<0.01, *** p<0.001. Values represent means ± SD (n=10). Figure 5 shows the histopathological changes of the hippocampus in offspring mice induced by prenatal exposure to nano-TiO2 at PND 21. In the control group, the wide spaces among the neurons, glial edema, normal pyramidal cell layer structure and axon structure were clearly observed. However, the hippocampal pyramidal cells in nano-TiO2 groups decreased and became thinner; the pyramidal cell arrangement was disordered; and pyramidal cells were denatured, necrotic and detached. Empty neuropils were also observed, suggesting a decrease in nerve fiber tracts (Figure 5). Figure 5: Histopathology of the hippocampal CA1 area in offspring mice following prenatal exposure to nano-TiO2 after postnatal day 21 (scale 25 μm). Control group indicated the wide spaces around the neurons, the light glial edema, the normal structure of pyramidal cell layer, and the Clear and recognizable axon. 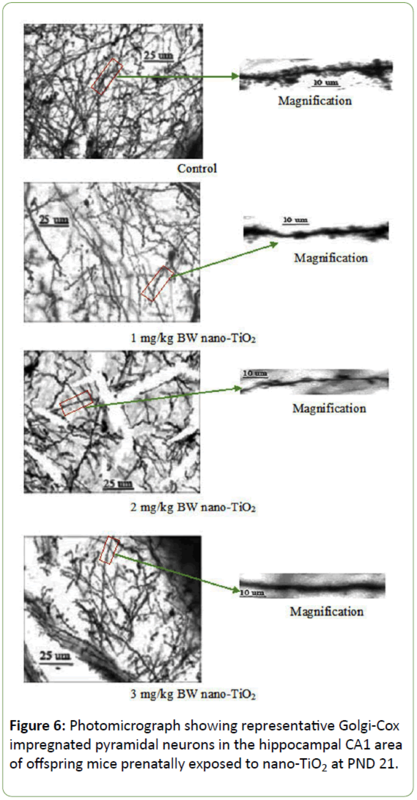 1 mg/kg BW nano-TiO2 group indicated nano-TiO2 deposition in hippocampus, light glial edema, disorder of pyramidal cell arrange, sparse and degeneration of glial cells. 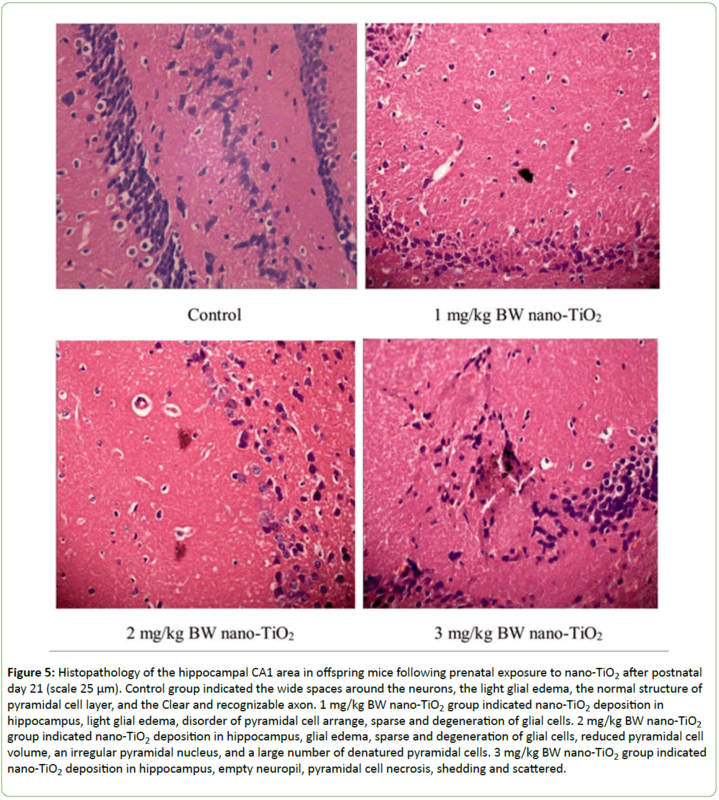 2 mg/kg BW nano-TiO2 group indicated nano-TiO2 deposition in hippocampus, glial edema, sparse and degeneration of glial cells, reduced pyramidal cell volume, an irregular pyramidal nucleus, and a large number of denatured pyramidal cells. 3 mg/kg BW nano-TiO2 group indicated nano-TiO2 deposition in hippocampus, empty neuropil, pyramidal cell necrosis, shedding and scattered. Morphological analysis was performed on a total of 500 hippocampal CA1 pyramidal neurons from ten offspring mice in each group. The Golgi-Cox impregnation procedure clearly filled the dendrite shafts and spines of pyramidal neurons from the hippocampal CA1 subfield in control offspring mice (Figure 6). However, in the prenatal nano-TiO2-treated offspring group, we observed a lower extent of Golgi-Cox impregnation of dendrite shafts and pyramidal neuronal spines (Figure 6). Data on total dendritic length and spine density were obtained from both sides of the hippocampus in offspring mice (Figure 7). CA1 pyramidal neurons from the prenatal nano-TiO2-treated groups showed significant atrophy in dendritic length compared with those of the control offspring group, with the 1, 2, and 3 mg/kg treatment groups showing a 22.55%, 39.24% and 61.34% reduction in total dendritic length, respectively (Figure 7, p<0.05). Compared with control offspring, the dendritic branches and spine density on dendritic trees of CA1 pyramidal cells were significantly decreased in the prenatal nano-TiO2- treated groups, with a 53.57%, 57.14% and 71.42% reduction in dendritic branch number and a 27.72%, 57.87%, and 75.74% reduction in spine density, respectively (Figure 7, p<0.05). Clearly, prenatal exposure to nano-TiO2 severely inhibits hippocampal neuron development in offspring mice. Figure 6: Photomicrograph showing representative Golgi-Cox impregnated pyramidal neurons in the hippocampal CA1 area of offspring mice prenatally exposed to nano-TiO2 at PND 21. Figure 7: Morphometric analysis of dendrites in CA1 pyramidal neurons of offspring mice prenatally exposed to nano-TiO2 at PND 21. * p <0.05, ** p <0.01, *** p <0.001. Values represent means ± SD (n=10). To determine the precise molecular mechanisms underlying suppression of hippocampal neuronal development in offspring mice, expression patterns of neuron outgrowth-related proteins were examined using western blot (Figure 8). Prenatal exposure to nano-TiO2 markedly suppressed the expression of MAP2, Erbb4, CRMP-3a, KIF-17, MKLP-1, and PSD-95 (Figure 8, p<0.05) but had no significant effect on tubulin expression in the hippocampus of offspring mice (Figure 8, p>0.05). Figure 8: Effects of prenatal exposure to nano-TiO2 on expression of neuron outgrowth-related proteins in offspring hippocampus. (a), (b) Representative western blots. (c), (d) Expression patterns of neuron outgrowth-related proteins. *p <0.05, **p <0.01, *** p<0.001. Values represent means ± SD (n=5). Studies to date demonstrate that prenatal exposure to nano- TiO2 decreases cognitive function in offspring rats but have not focused on dendritic development and the underlying molecular mechanisms associated with this process [31-34]. Recently, we reported that exposure to nano-TiO2 in vitro resulted in significant suppression in neurite growth in primary cultured hippocampal neurons [46,47]. In the current study, we investigated the effects of prenatal exposure to nano-TiO2 on the development of hippocampal dendritic morphology and the associated molecular mechanisms related to this exposure in offspring mice. Our data suggest that in mice prenatally exposed to nano-TiO2, nanoparticles translocate from the maternal to the offspring brain (Figures 2 and 5), demonstrating that nano-TiO2 can cross the fetal blood barrier. Due to the translocation of nano-TiO2, prenatal exposure leads to significant reductions in brain coefficients (Figure 1) and spatial recognition (Figures 3 and 4); increases hippocampal damage (Figure 5); alters pyramidal neuron dendritic spines and shafts; and reduces dendritic branching and spine density in CA1 pyramidal cells in the offspring hippocampus (Figures 6 and 7). Based on these results, we propose that decreased learning and memory are closely associated with suppression of dendritic development, which may have been triggered by changes in dendritic development-related protein expression in offspring mice as a result of prenatal exposure to nano-TiO2. Neurons are polarized cells, with axon and dendrites at opposing sides, which determines polarity during development. In hippocampal neurons, the branch of apical dendrites plays a key role in the process of accepting incoming information, axons determine the scope and breadth of information spread, and basal dendrites play a crucial role in the feedback loop formation. Therefore, the dendritic shape is critical for neurons receiving input, with tree branching being critical for the formation of neural circuits. The critical period of brain development is during pregnancy and the early postnatal stage. The period of exposure to nano-TiO2 may thus influence neuronal development and the normal neural network. The mechanism of nano-TiO2-mediated suppression may be related to its regulatory effects on proteins that function in brain development. Tubulin and MAPs are known to be important foundation materials for neurite growth. Among these, MAP2, a heat-stable protein of the structural MAP family, is mainly expressed in neuronal somata and dendrites of the CNS and are believed to interact with and to promote microtubule stability. MAP2 may also be involved in neuronal development and structural stability, the formation apophysis, and in the regulation of synaptic plasticity . In addition to MAPs, numerous key molecules involving neuronal processes and development and apophysis development have been identified, including MKLP1, CRMP3, ErbB4, and KIF17 [36-40]. Inhibition of MKLP1 expression not only suppresses the development of neuronal dendrites but also results in loss of characteristics of complete morphology and of molecular composition of dendrites, ultimately leading to loss of dendritic function . CRMP3 is an important brain-specific protein upstream of serine/threonine protein kinase activation that acts as an intracellular signaling molecule. IT influences cone neurite morphology by directly regulating cytoskeletal integrity and participates in the establishment of synaptic structure and neural networks . An earlier study by Mechawar et al. demonstrated that ErbB4 is expressed by neuronal somatodendrites in the cerebral cortex and hippocampus from birth to adulthood, supporting a role for neuregulins in dendritic growth and plasticity . Selective ablation of ErbB4 from excitatory neurons leads to a reduction in the proportion of mature spines and overall dendritic spine density in the prefrontal cortex of weanling (PND 21) mice that persists at 2 months of age . These results suggest that ErbB4 signaling in excitatory pyramidal cells is critical for the proper formation and maintenance of dendritic spines. In highly polarized cells such as neurons, sorting and delivery processes of organelles depend on the KIF protein family [50,51]. KIF17, a member of the kinesin superfamily of proteins, plays a fundamental role in spatial learning and memory [52,53]. Zhao et al. demonstrated that prenatal stress leads to long-lasting deterioration of the expression and function of hippocampal KIF17 in offspring, which may be related to deficits in spatial cognition . Importantly, in the context of dendritic transport in neurons, KIF17 has been implicated in trafficking of glutamate receptors to the synapse [40,55,56]. In the present study, prenatal exposure to nano-TiO2 induced a significant decrease in the levels of MAP2, MKLP1, CRMP3, ErbB4, and KIF17 but had no marked effect on tubulin protein expression in the hippocampus of offspring mice (Figure 8). Our findings suggest that suppression of dendritic development in offspring mice prenatally exposed to nano-TiO2 is closely associated with a reduction of MAP2, MKLP1, CRMP3, ErbB4, and KIF17, which in turn leads to decreased learning and memory. Additionally, prenatal exposure to nano-TiO2significantly inhibited PSD-9 expression (Figure 8). PSD-95 is expressed in central synapses and contributes to synapse and dendritic development . Accordingly, developmental disorders of hippocampal neurons in offspring mice may also be associated with downregulation of PSD-95 induced by prenatal exposure to nano-TiO2. As discussed, it may be inevitable that people are exposed to nano-TiO2, and measures should be considered to treat possible nervous system injuries associated with this exposure. Nutraceuticals or diet elements have been demonstrated to improve human health , and it may be possible to decrease nano-TiO2 induced neurotoxicity by consuming nutraceuticals or diet elements. Prenatal exposure to nano-TiO2 results in deposition in the offspring brain, resulting in decreased learning and memory in offspring mice, which appears to be related to hippocampal damage and suppression of hippocampal dendritic development. Furthermore, expression of dendritic developmentally related proteins, including MAP2, MKLP1, CRMP3, ErbB4, KIF17 and PSD-95, is inhibited in mice prenatally exposed to nano-TiO2, suggesting that disruption of hippocampal neuronal development in offspring mice is triggered via altered regulation of proteins involved in dendritic development. A schematic depicting the proposed mechanism of TiO2 NP-mediated suppression of neuron dendritic development in offspring mice is presented in Figure 9. In view of these findings, we recommend that application of nano-TiO2 in food, cosmetics, sunscreens, toothpastes, and daily products for infants and children be performed with caution. Figure 9: Schematic representation of the potential mechanism underlying nano TiO2 suppression of neuron dendrite development in offspring mice. FH contributed to the design of the whole study and the proof reading of the paper. FH, LW and YJ contributed to the experiments of mice, morphology examination, assays of behavioral experiment, protein expression, and TiO2 NPs contents. All authors read and approved the final manuscript. This work was supported by the National Natural Science Foundation of China (grant Nos. 31671033, 81473007, 81273036 and 30901218), the National Natural Science Foundation of Jiangsu Province (grant No. BK20161306), Huaian science and technology project (HAN201604) and the Top-notch Academic Programs Project of Jiangsu Higher Education Institutions (PPZY2015A018). Baan R, Straif K, Grosse Y, Secretan B, El Ghissassi F, et al. (2006) Carcinogenicity of carbon black, titanium dioxide, and talc. Lancet Oncol 7: 295-296. Shukla RK, Sharma V, Pandey AK, Singh S, Sultana S, et al. 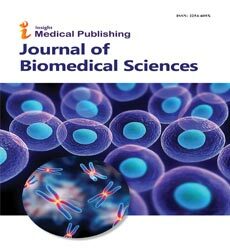 (2011) ROS mediated genotoxicity induced by titanium dioxide nanoparticles in human epidermal cells. Toxicol In Vitro 25: 231-241. Kaida T, Kobayashi K, Adachi M, Suzuki F (2004) Optical characteristics of titanium oxide interference film and the film laminated with oxides and their applications for cosmetics. J Cosmet Sci 55: 219-220. Wolf R, Matz H, Orion E, Lipozencic J (2003) Sunscreens-the ultimate cosmetic. Acta Dermatovenerol Croat 11: 158-162. Chaudhry Q, Scotter M, Blackburn J, Ross B, Boxall A, et al. (2008) Applications and implications of nanotechnologies for the food sector. Food Addit Contam A 25: 241-258. U.S. EPA (2010) Nanomaterial Case Studies: Nanoscale Titanium Dioxide in Water Treatment and in Topical Sunscreen. US Environmental Protection Agency, EPA/600/R-09/057F. Weir A, Westerhoff P, Fabricius L, Hristovski K, von Goetz N (2012) Titanium dioxide nanoparticles in food and personal care products. Environ Sci Technol 46: 2242-2250. Hong FS, Yu XH, Wu N, Zhang YQ (2017) Progress of in vivo studies on the systemic toxicities induced by titanium dioxide nanoparticles. Toxicol Res 6: 115-133. Liu HT, Ma LL, Zhao JF, Liu J, Yan JY, et al. (2009) Biochemical toxicity of nano-anatase TiO2 particles in mice. Biol Trace Elem Res 129:170-180. Sul YT (2010) Electrochemical growth behavior, surface properties, and enhanced in vivo bone response of TiO2 nanotubes on microstructured surfaces of blasted, screw-shaped titanium implants. Int J Nanomed 5: 87-100. Simkó M, Mattsson MO (2010) Risks from accidental exposures to engineered nanoparticles and neurological health effects: a critical review. Part Fibre Toxicol 7: 42. Tin-Tin Win-Shwe, Fujimaki H (2011) Nanoparticles and neurotoxicity. Int J Mol Sci 12: 6267-6280. Iavicoli I, Leso V, Bergamaschi A (2012) Toxicological effects of titanium dioxide nanoparticles: A review of in vivo studies. J Nanomater 2012:1-36. Chang XH, Zhang Y, Tang M, Wang B (2013) Health effects of exposure to nano-TiO2: a meta-analysis of experimental studies. Nanoscale Res Lett 8: 51. Shi HB, Magaye R, Castranova V, Zhao JS (2013) Titanium dioxide nanoparticles: a review of current toxicological data. Part Fibre Toxicol 10: 15. Song B, Liu J, Feng XL, Wei LM, Shao LQ (2015) A review on potential neurotoxicity of titanium dioxide nanoparticles. Nanoscale Res Lett 10: 342. Wang JX, Zhou GQ, Chen CY, Yu HW, Wang TC, et al. 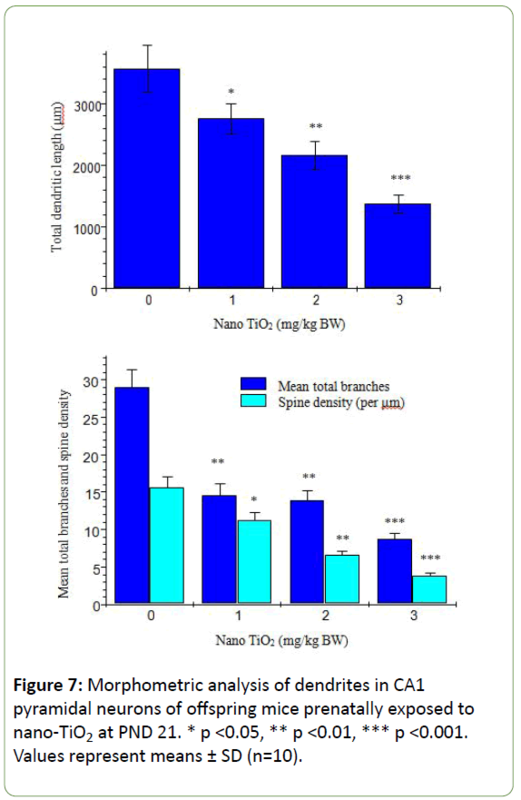 (2007) Acute toxicity and biodistribution of different sized titanium dioxide particles in mice after oral administration. Toxicol Lett 168: 176-185. Wang JX, Liu Y, Jiao F, Lao F, Li W, et al. (2008) Time-dependent translocation and potential impairment on central nervous system by intranasally instilled TiO2 nanoparticles. Toxicol 254: 82-90. Wang JX, Chen CY, Liu Y, Jiao F, Li W, et al. (2008) Potential neurological lesion after nasal instillation of TiO2 nanoparticles in the anatase, rutile crystal phases. Toxicol Lett 183: 72-80. Ma LL, Liu J, Li N, Wang J, Duan YM, et al. (2010) Oxidative stress in the brain of mice caused by translocated nanoparticulate TiO2 delivered to the abdominal cavity. Biomaterials 31: 99-105. Hu RP, Gong XL, Duan YM, Li N, Che Y, et al. (2010) Neurotoxicological effects and the impairment of spatial recognition memory in mice caused by exposure to TiO2 nanoparticles. Biomaterials 31: 8043-8050. Hu RP, Zheng L, Zhang T, Cui YL, Gao GD, et al. (2011) Molecular mechanism of hippocampal apoptosis of mice following exposure to titanium dioxide nanoparticles. J Hazard Mater 191: 32-40. Ze YG, Hu RP, Wang XC, Sang XZ, Ze X, et al. (2014) Neurotoxicity and gene-expressed profile in brain-injured mice caused by exposure to titanium dioxide nanoparticles. J Biomed Mater Res Part A 102: 470-478. Ze YG, Sheng L, Zhao XY, Ze X, Wang XC, et al. (2014) Neurotoxic characteristics of spatial recognition damage of the hippocampus in mice following subchronic peroral exposure to TiO2 nanoparticles. J Hazard Mater 264: 219-229. Su MY, Ze YG, Zhao XY, Wang L, Yu XH, et al. (2015) Neurotrophin-related factors may be involved in TiO2 NP-induced hippocampal inflammation. Toxicol Res 4: 344 - 350. Hayashi A, Nagaoka M, Yamada K, Ichitani Y, Miake Y, et al. (1998) Maternal stress induces synaptic loss and developmental disabilities of offspring. Int J Dev Neurosci 16: 209-216. Iqbal U, Dringenberg HC, Brien JF, Reynolds JN (2004) Chronic prenatal ethanol exposure alters hippocampal GABAA receptors and impairs spatial learning in the guinea pig. Behav Brain Res 150: 117-125. Shimizu M, Tainaka H, Oba T, Mizuo K, Umezawa M, et al. (2009) Maternal exposure to nanoparticulate titanium dioxide during the prenatal period alters gene expression related to brain development in the mouse. Part Fibre Toxicol 6: 20. Takeda K, Suzuki KI, Ishihara A, Kubo-Irie M, Fujimoto R, et al. (2009) Nanoparticles transferred from pregnant mice to their offspring can damage the genital and cranial nerve system. J Health Sci 55: 95-102. Takahashi Y, Shinkai Y, Mizuo K, Oshio S, Takeda K (2010) Prenatal exposure to titanium dioxide nanoparticles increases dopamine levels in the prefrontal cortex and neostriatum of mice. J Toxicol Sci 35: 749-756. Mohammadipour A, Hosseini M, Fazel A, Haghir H, Rafatpanah H, et al. (2016) The effects of exposure to titanium dioxide nanoparticles during lactation period on learning and memory of rat offspring. Toxicol Industrial Health 32: 221-228. Mohammadipour A, Fazel A, Haghir H, Motejaded F, Rafatpanah H, et al. (2014) Maternal exposure to titanium dioxide nanoparticles during pregnancy; impaired memory and decreased hippocampal cell proliferation in rat offspring. Environ Toxicol pharmacol 37: 617-625. Gao X, Yin S, Tang M, Chen J, Yang Z, et al. (2011) Effects of developmental exposure to TiO2 nanoparticles on synaptic plasticity in hippocampal dentate gyrus area: an in vivo study in anesthetized rats. Biol Trace Elem Res 143: 1616-1628. Cui YH, Chen XY, Zhu Z, Lei Y, Ma MN, Cao RJ, et al. (2014) Prenatal exposure to nanoparticulate titanium dioxide enhances depressive-like behaviors in adult rats. Chemosphere 96: 99-104. Li AQ, Mao WG, Chen HR, Huang S, Ye J, et al. (2003) A novel microtubule associated protein, regulates homeostasis of intracellular amino acids in PC12 cells. Chin Sci Bull 48: 1828-1834. Xu X, He C, Zhang Z, Chen Y (2006) MKLP1 require specific domains for its dendritic targeting. J Cell Sci 119: 452-458. Quach TT, Massieotte G, Belin MF, Honnorat J, Glasper ER, et al. (2008) CRMP3 is required for hippocampal CAI dendritic organization and plastieity. FASEB J 22: 401-409. Meehawar N, Laeoste B, Yu WF, Srivastava LK, Quirion R (2007) Developmental Profile of neuregulin receptor ErbB4 in postnatal rate cerebral cortex and hippocampus. Neurosci 148: 126-139. Manns RPC, Cook GMW, Holt CE, Keynes RJ (2012) Differing semaphorin 3A concentrations trigger distinct signaling mechanisms in growth cone collapse. J Neurosci 32: 8554-8559. Guillaud L, Setou M, Hirokawa N (2003) KIF17 dynamics and regulation of NR2B trafficking in hippocampal neurons. J Neurosci 23: 131-140. National Institute for Occupational Safety and Health (2011) Outlines Guidance on Handling Titanium Dioxide (TiO2). Atlanta. Akwa Y, Ladurelle N, Covey DF, Baulieu EE (2001) The synthetic enantiomer of pregnenolone sulfate is very active on memory in rats and mice, even more so than its physiological neurosteroid counterpart: distinct mechanisms. Proc Natl Acad Sci USA 98: 14033-14037. Dellu F, Contarino A, Simon H, Koob GF, Gold LH (2010) Genetic differences in response to novelty and spatial memory using a two-trial recognition task in mice. Neurobiol Learn Mem 73: 31-48. Masur J, Martz RMW, Carlini EA (1971) Effects of acute and chronic administration of Cannabis sativa and a9-trans-tetrahydrocannabinol on the behavior of rats in an open field arena. Psychopharmacol 19: 338-97. Juarez I, Gratton A, Flores G (2008) Ontogeny of altered dendritic morphology in the rat prefrontal cortex, hippocampus, and nucleus accumbens following Cesarean delivery and birth anoxia. J Comp Neurol 507: 1734-1747. Hong FS, Sheng L, Ze YG, Hong J, Zhou YJ, et al. (2015) Suppression of neurite outgrowth of primary cultured hippocampal neurons is involved in impairment of glutamate metabolism and NMDA receptor function caused by nanoparticulate TiO2. Biomaterials 53: 76-85. Hong FS, Ze YG, Zhou YM, Hong J, Yu XH, et al. (2017) Nanoparticulate TiO2-mediated inhibition of the Wnt signaling pathway causes dendritic development disorder in cultured rat hippocampal neurons. J Biomed Mater Res Part A 105: 2139-2149. Mechawar N, Lacoste B, Yu WF, Srivastava LK, Quirion R (2007) Developmental profile of neuregulin receptor ErbB4 in postnatal rat cerebral cortex and hippocampus. Neurosci 148: 126-139.
Cooper MA, Koleske AJ (2014) Ablation of ErbB4 from excitatory neurons leads to reduced dendritic spine density in mouse prefrontal cortex. J Comp Neurol 522: 3351-3362. Hirokawa N (1996) Organelle transport along microtubules-the role of KIFs (kinesin superfamily proteins). Trends Cell Biol 6: 135-141. Hirokawa N (1998) Kinesin and dynein superfamily proteins and the mechanism of organelle transport. Sci 279: 519-526. Wong RW, Setou M, Teng J, Takei Y, Hirokawa N (2002) Overexpression of motor protein KIF17 enhances spatial and working memory in transgenic mice. Proc Natl Acad Sci USA 99: 14500-14505. Yin X, Takei Y, Kido MA, Hirokawa N (2011) Molecular motor KIF17 is fundamental for memory and learning via differential support of synaptic NR2A/2B levels. Neuron 70: 310-325. Zhao DP, Liu D, Chen XY, Wang K, Zhang A, et al. (2013) Prenatal Stress Disturbs Hippocampal KIF17 and NR2B in Spatial Cognitionin Male Offspring. 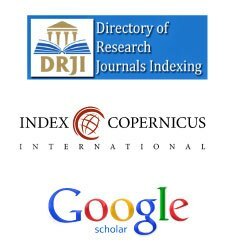 J Neurosci Res 91: 535-544. Setou M, Nakagawa T, Seog DH, Hirokawa N (2000) Kinesin superfamily motor protein KIF17 and mLin-10 in NMDA receptor-containing vesicle transport. Sci 288: 1796-1802. Kayadjanian N, Lee HS, Pina-Crespo J, Heinemann SF (2007) Localization of glutamate receptors to distal dendrites depends on subunit composition and the kinesin motor protein KIF17. Mole Cell Neurosci 34: 219-230. Irie M, Hata Y, Takeuchi M, Ichtchenko K, Toyoda A, et al. (1997) Binding of neuroligins to PSD-95. Sci 277: 1511-1515. Scicchitano P, Cameli M, Maiello M, Modesti PA, Muiesan ML, et al. (2014) Nutraceuticals and dyslipidaemia: Beyond the common therapeutics. J Funct Foods 6: 11-32.